An original letter of correspondence between brothers and business partners Joshua Coffin Chase and Sydney Octavius Chase. 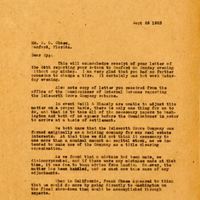 Topics discussed in the letter include Sydney's visit to Sanford, an enclosed copy of a letter from the Commissioner of Internal Revenue to Sydney regarding the Isleworth Grove Company returns, and planning a trip to Washington, D.C. Original letter from Joshua Coffin Chase to Sydney Octavius Chase, September 25, 1923: box 49, folder 20.84, Chase Collection (MS 14), Special and Area Studies Collections, George A. Smathers Libraries, University of Florida, Gainesville, Florida. Digital reproduction of original letter from Joshua Coffin Chase to Sydney Octavius Chase, September 25, 1923. This will acknowledge receipt of your letter of the 24th reporting your return to Sanford on Sunday evening without any mishap. I am very glad that you had no further occasion to change a tire. It certainly was hot work Saturday evening. Also note copy of letter you received from the office of the Commissioner of Internal Revenue regarding the Isleworth Grove company returns. In event Weill & Blakely are unable to adjust this matter on a proper basis, there is only one thing for us to do, and that is to take all of the necessary papers to Washington and both of us appear before the Commissioner in order to arrive at a basis of settlement. We both know that the Isleworth grove Company was formed originally as a holding company for our real estate interests. At that time we did not think it necessary to use more than a nominal amount as capital stock, as we intended to make use of the Company as a title clearing organization. As we found that a mistake had been made, we disincorporated, and if there were any mistakes made at that time, it was due to bumm advice from Landis. However, the matter has been handled, and we must now take care of any adjustments. When in California, Frank Chase appeared to think that we could do more by going directly to Washington on the final show-down than could be accomplished through experts. Chase, Joshua Coffin. 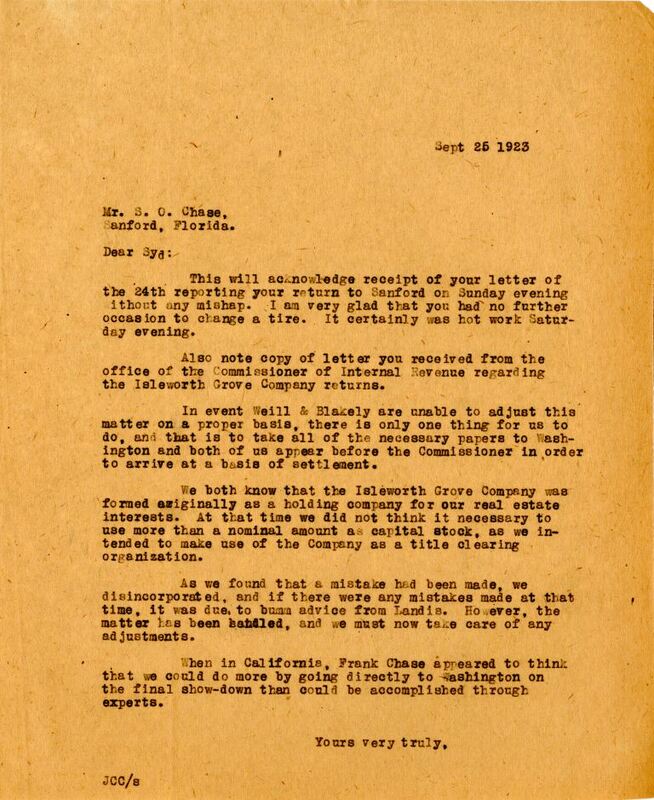 “Letter from Joshua Coffin Chase to Sydney Octavius Chase (September 25, 1923).” RICHES of Central Florida accessed April 24, 2019, https://richesmi.cah.ucf.edu/omeka/items/show/2748.